Our Savior said in John 4:35, "Do you not say, 'There are yet four months, and then comes the harvest '? Behold, I say to you, lift up your eyes and look on the fields, that they are white for harvest." At Crossroads our sincere desire is to know Jesus Christ and share His gospel. He is the reason we exist, the reason we worship, and the hope of our salvation. Thus, everything we do is to the glory of Him who died on Calvary, who burst forth from the grave, and who sits at the right hand of God today, interceding for us! Our mission and ministry at Crossroads center around glorifying God through making disciples who worship Christ, walk with Christ, and work for Christ. 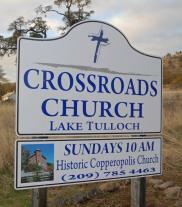 Crossroads is a church decidicated to teaching and serving the members and the community.